Enjoy this animal clip art. Please keep in mind it is hand-drawn and hand colored. IF YOU ENJOY OUR STYLE FOLLOW US FOR MORE COOL ANIMAL CLIP ART TO GET UPDATES ON NEW LISTINGS AND SALES. 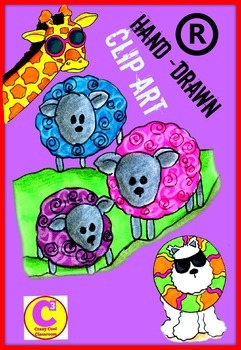 check out more ANIMAL CLIP ART click here in our store. Big thanks to our artist Vicki Schmand! Please take a second to write a feedback:)Let us know what you think. Thank you for visiting my store. Use the royalty-free graphics in the Animal Clip Art Collection on both personal and commercial projects. The only time you cannot use our work is to start your own clip art business. These are for personal or commercial use which means you may use them in a teaching resource as long as you give a simple credit with a link to my store.